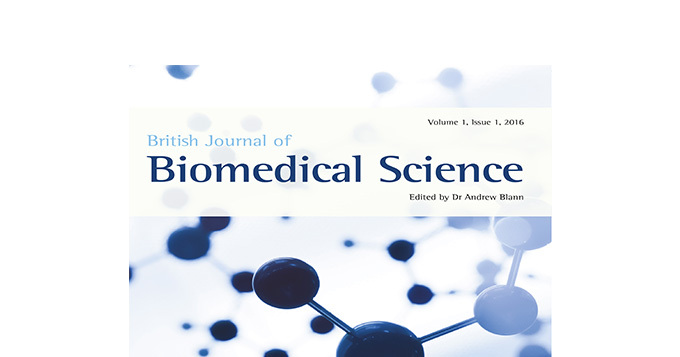 The IBMS have announced the relaunch of the British Journal of Biomedical Science (BJBS) to be published by Taylor& Francis Group under the new Editorship of Dr Andrew Blann PhD FIBMS FRCPath FRCPE. The British Journal of Biomedical Science (BJBS) is the profession’s leading journal, featuring authoritative papers and short reports on new laboratory techniques and principles. The move to leading academic and professional publisher Taylor & Francis Group marks the beginning of a partnership with one of the leading publishers of online journals. In addition to a refreshed design, the latest edition of the BJBS will benefit from a new online platform offering new state-of-the-art features and functionality. The new editor aims to make the BJBS increasingly relevant to its global laboratory scientist readership. In addition to a stronger focus on partnership with industry, with technical reviews covering advances in methodology and instrumentation, the BJBS will also forge close ties with academic institutions, working closely with higher education institutions offering undergraduate and post graduate degree courses in Biomedical Sciences and featuring the best of undergraduate and postgraduate research in the field of biomedical science. From Spring 2017 the BJBS will feature an annual update summarising major advances in each of the biomedical science disciplines, supporting laboratory scientists in meeting professional and registration requirements to keep up to date with the latest developments in their field. Contributors will also benefit from a streamlined online article submission process, with Dr Blann, keen to encourage high-quality original research submissions from the UK and overseas: “The BJBS is truly international Journal. In 2015 over than half of the Journal’s published articles were from contributors based outside the UK. With the BJBS we aim to provide a platform for the dissemination of new and innovative information on the diagnosis and management of disease that is valuable to the practicing laboratory scientist anywhere in the world.”. Further information and a selection of free access articles from current and previous editions of the British Journal of Biomedical Science are available online.